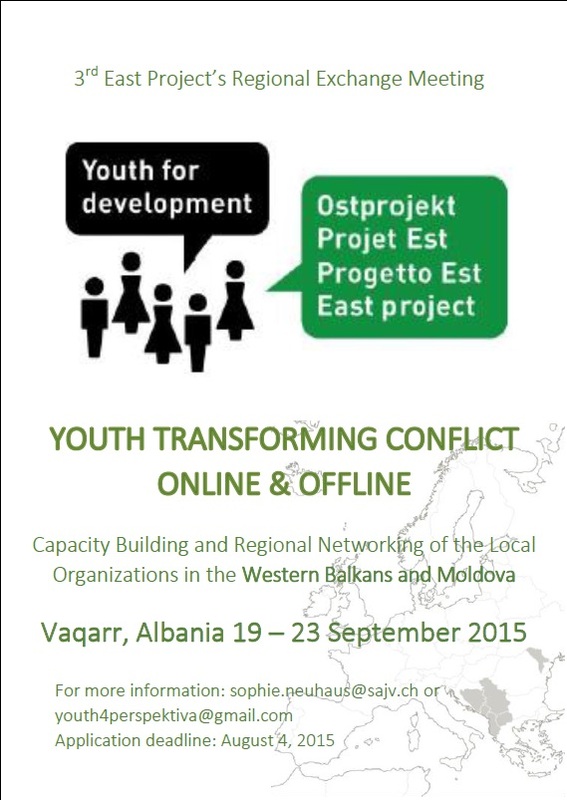 Swiss National Youth Council together with the Youth Center “Perspektiva” are organizing 3rd East Project’s Regional Exchange Meeting “Youth Transforming Conflict Online & Offline” in Vaqarr, Albania on 19-23 September 2015. East Project is a project lead by the National Youth Council of Switzerland, on a mandate of the Swiss Agency for Development and Cooperation. The East Project has been supporting youth organizations from the Western Balkans since 1991 and is currently focuses on the non-UE countries of the region, and Moldova. East Project facilitates the exchange between Swiss and Balkan youth by giving them the opportunity to develop common projects towards a better living-together. The regional exchange meeting is based on a youth-to-youth approach to learn jointly from the issues faced by youth organizations and find solutions together. This year’s topic will be “Youth Transforming Conflict Online & Offline”. Conflicts have a broad scope and might affect young people at different levels: at the personal level, at the level of the civil society organization that they are involved in and at the level of the community. Even when young people are not directly involved in a conflict, they are always among the first ones to be affected by its negative consequences through the psychological damage, destruction of social life and opportunities for self-development. Online dimension of the programme gains importance because of the inalienable impact of social media and internet on the lives of young people. Internet opens great opportunities to develop, communicate, learn and cooperate, but it also exposes young people to hate speech and cyberbullying that are often the reflections of conflicts in the community. During this regional meeting, we will therefore learn how to face diverse conflict situations online and offline, and different methods to transform the conflict, based on the method developed by the “Youth Partnership” and various approaches within the framework of the human rights education. “Youth Partnership” is a joint initiative between the European Commission and the Council of Europe in the field of youth. Selection will be undertaken by the Swiss National Youth Council regarding the above-mentioned criteria. The geographic origin and the purpose of ensuring a broad scope of organizations will guide the choice of participants. Number of participants: 24. An organization can nominate maximum 2 people. To apply, please, fill in the application form Call for Application_Regional Meeting_Project East and e-mail to sophie.neuhaus@sajv.ch, with CC. to youth4perspektiva@gmail.com, by Tuesday August 4 2015, 23:59. Participants are expected to arrive on 19th September (morning) and leave on 23rd September (afternoon). If not possible, a 5th night (18th or 23rd) can be discussed on a case-by-case basis. Shuttle buses will be arranged from Tirana to Vaqarr. More information will be shared with selected participants. For questions concerning the content of the event, please contact Sophie Neuhaus from National Youth Council of Switzerland at sophie.neuhaus@sajv.ch and/or Iana Minochkina and Luis Bekteshi from Youth Center “Perspektiva” at youth4perspektiva@gmail.com.